CPMServe | AdsWiki - Ad Network Listing, Reviews, Payment Proof & Advertising News. Since 2003, CPMServe is an Ad network based in United States. CPMServe can be adjusted to handle any publisher, network od advertiser demands. CPMServe provide real time online channels for advertising web, mobile and social with Programmatic marketing strategies to ensure efficiency and quality in our campaigns. I’m Proud to say that CPMServe is one of the fastest growing online advertising agency in the world with serving over millions of impressions daily. We offer the chance of becoming your One Stop Shop for all your online marketing needs, such as: ?Monetize your inventory ?CPC / CPM Ads ?Implementation and conversion tracking ?More than 3000 Advertisers at a time and more than 10000 Publishers ?Media plan development and optimization ?Auto eCPM optimization ?Real time reporting ?Multiple Channels, Text, Display, Mobile & In app. We are using CPMServe as adserver, maybe you are already familiar with the platform. We serve our managed advertisers placements, and from many partners inside the marketplace. The platform has many useful ad quality tools, to adapt the banners we serve to your needs. It is our pleasure to invite you to do business with us. Thank you for your time. I am presently not being owed by any network. I did not call any network a SCAM except yours, I only complained of payments & they paid either saying they did not receive my invoice or some other excuses. Be truthful to yourself and check my comments on Adswiki. 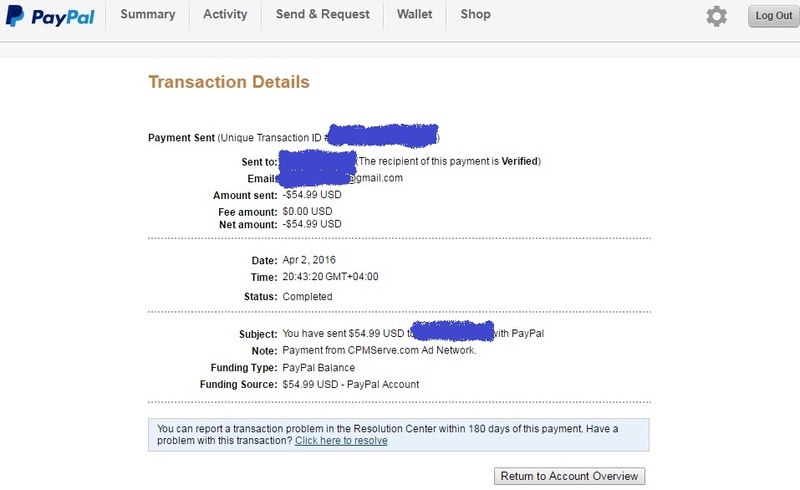 Just like the comment below @Mii Wick, he shows payment proof made by cpmserve (a receipt to cpmserve from paypal showing the amount sent). Please, how did your publisher get your paypal payment receipt??? Smh! I truly thought you are legit until you promised to pay and did not. Please, whatelse do you call that?? SCAM! PAY WHAT YOU OWE! What is your excuse? 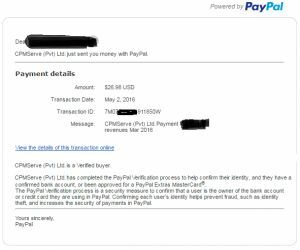 CPMServe (Pvt) Ltd. just sent you $124.08 USD with PayPal. 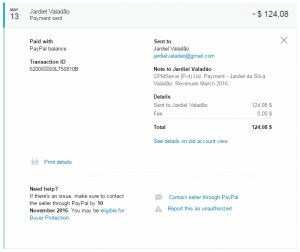 CPMServe (Pvt) Ltd. Payment – Jardiel da Silva Valadão. Revenues March 2016. 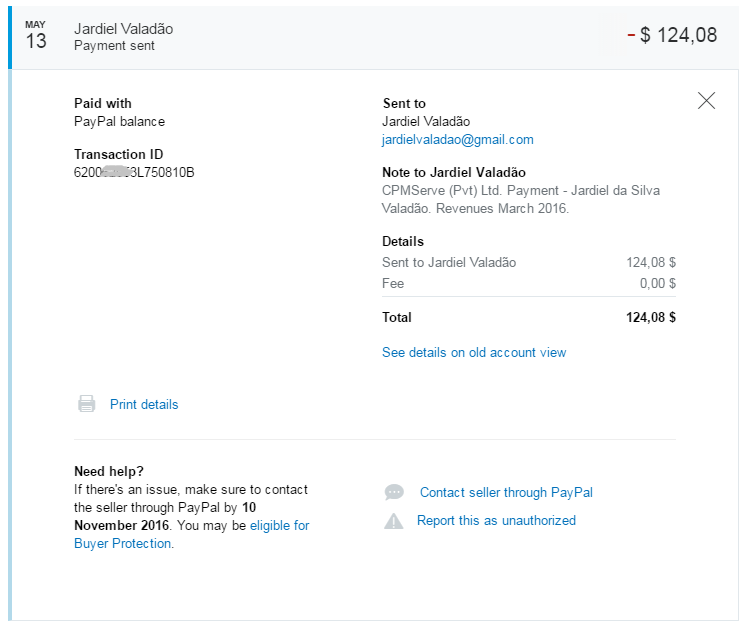 I am yet to receive payments for February and March after you asked for my paypal email and promised to pay. Why? I have noticed at here and other websites about your payments which is not paid to you. I couldn’t understand that all networks are not sincere with you. You misunderstand people and wrote scam to all networks. You look yourself like a scammer. I am presently not being owed by any network. I did not call any network a SCAM except yours, I only complained of payments on ONLY 2 ADNETWORKS & they paid either saying they did not receive my invoice or some other excuses. Be truthful to yourself and check my comments on Adswiki. AND FYI, I HAVE NEVER EVER EVER COMMENTED ON ANY OTHER WEBSITE. Still no payment after promises. SCAM! i think cpmserve.com is best because i have received continuously monthly payments with cpmserve ads. More than 45 days after, I have not been paid. Asked for my paypal email nut after that, they cut off communication. They also cleared up impressions in stats without converting them to earnings. However, they left the counted clicks in stats. Then started the count from zero again. Am I miss something? Smells like SCAM! Beware!! Taking down their ads. I have sent my username but I was being told stories after which my mails were ignored. Was told my earnings ($59) was for last month (March) and I should follow company payment policy. (However, all March earnings have not been converted to $$.) 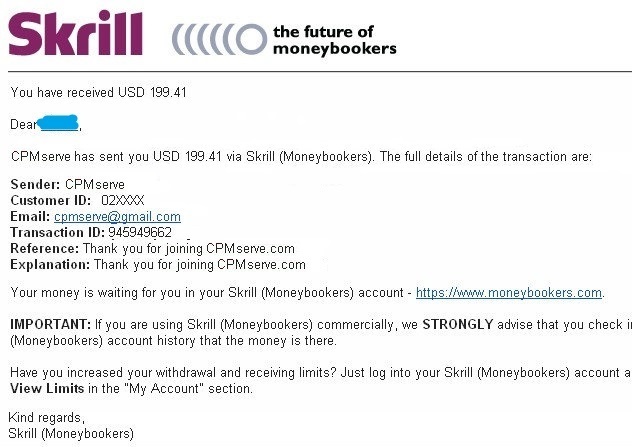 I told whoever owns the mail my earnings as at the end of Feb was $59 and according to a mail sent by cpmserve admin, payment was supposed to be done by March 15. My last message was ignored. If you guys were not able to pay me as at that date, I guess an apology to pay at a later date is in order. Not trying to lie about when I earned that amount. It’s an important notice for all Publishers. CPMServe started a new ad exchange for all those publishers who have real traffic and wants to earn maximum in minimum short time. CPMServe ad exchange offers 100% fill rates and made payment on time automatically. CPMServe ad exchange is for only those publishers who have 100% real traffic. If any publisher want to use CPMServe ad exchange as a publisher he should contact at the bottom E-Mail address. I have not received my payments for last month and they are ignoring all my mails to them… N.B: I wasn’t banned. Are they still legit? Please send username to [email protected] .